Each year CARE asks local elementary and middle school students to contribute artwork to the CARE Art Contest. Each drawing represents the idea of healthy living without drugs and alcohol. Out of hundreds of submissions, CARE volunteers selected 65 pieces to be displayed at NorthPark Center. Of the 65 pieces, six were deemed “Exemplary”. The exhibit runs from May 7 through May 20 at NorthPark. Joy Ting is in the 8th grade and her picture features a key and a “drug free” rhyme. Joy has played tennis for three years. She also enjoys arts and crafts in her spare time. Joy has a younger brother and sister and enjoys snorkeling. 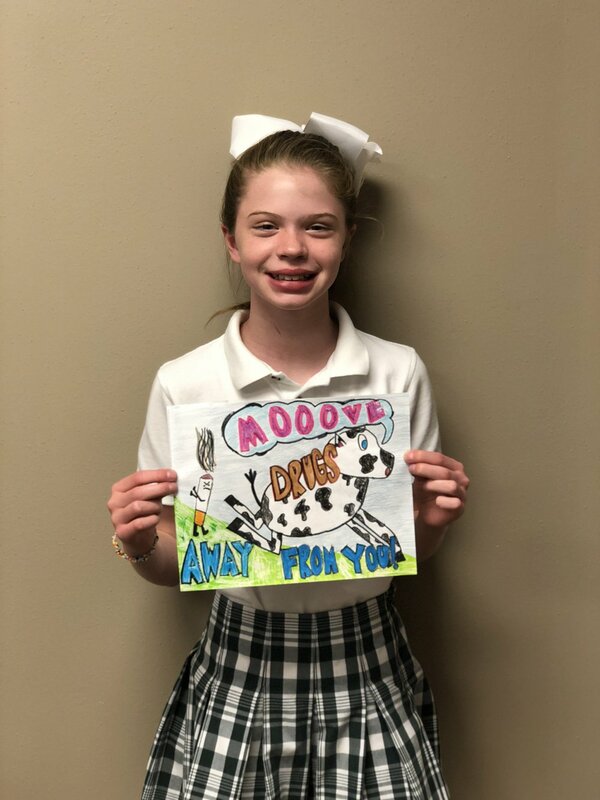 Emmy Roberts is a 5th grader who chose a cow for her artwork because she loves cows. She enjoys playing basketball in her spare time. She has a younger sister, an older stepsister, and 2 dogs. This summer, Emmy will help clean up White Rock Lake and will attend Camp Waldemar. Anya Ahuja is a 5th grader and her artwork represents a “portrait” of what someone looks like doing drugs and not doing drugs. She enjoys the violin, math, golf, and reading in her spare time. She also likes to play with Wonder, her Havanese-Maltese puppy. Alison Zou is a 7th grader who likes dragons and chose a dragon for her artwork theme. She enjoys computer graphics, reading and video games. She also likes to “doodle." Alison moved to Dallas from Beijing China a year ago and lives with her parents and her older brother. 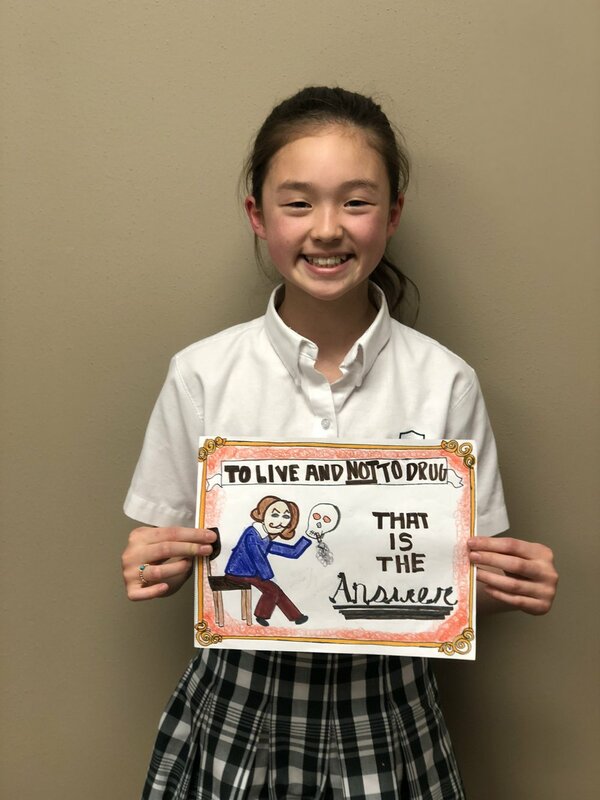 Audrey Ha is in the 5th grade and her artwork features a famous person (Shakespeare) and a slogan she created. In her free time, she likes to do artwork and read. Audrey is trained in ballet, contemporary, lyrical, and character dance. She also likes science and math. Audrey has a brother and a pet hamster, Daisy. This summer, Audrey will volunteer with Transform Dallas. Maron Shiller is a 7th grader who loves all types of dance: lyrical, jazz, and ballet. Her artwork features a colorful pig which she refers to as her “spirit animal." This summer Maron will attend Camp Longhorn as well as volunteer for Meals on Wheels. When she grows up, Maron hopes to be a yoga teacher or art teacher. Maron has a sister, Maddox and enjoys her cat Oleo and dog Shammy.